IBC – A never ending story? As promised by my colleague, Rüdiger Pansch (please see his post on “Munich Appellate Court on Making vs. Repair” dated 28 October 2011 and the other earlier Blogs cited therein) we are keeping you updated on what is going on at the IBC-front. The German Federal Supreme Court rendered a judgment on 17 July 2012 (docket no. 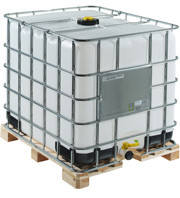 X ZR 113/11) in one of the two cases dealing with intermediate bulk containers (IBC) as pictured above – without deciding on the “philosophic” and extensively discussed question whether an IBC stays the old IBC or becomes a new one, when the plastic bottle is replaced by a new one. One aspect of the patent claim was that the grid rods of the outer steel cage should be designed in a special way so that a “climbing” of neighbouring pallet containers on account of twisting of the loading surface when the containers are transported should be precluded. The Federal Supreme Court found that the features, which served this purpose, were neither fulfilled literally nor equivalent in the attacked IBC. A solution, which differs from the wording of the patent claim, should only be regarded as exercising essentially similar effects (“gleichwirkend”), if it does not only basically achieve the general effect of the invention, but specifically also the effect, which the non-literally fulfilled feature should achieve. If – according to the interpretation of the patent claim – minimum standards regarding the quantity or quality of a special effect are required, modified means, which do not fulfil these requirements, cannot be regarded as exercising essentially similar effects (“gleichwirkend”) under the aspect of a less advantageous embodiment, even if all other effects of the patented solution are generally achieved. So, one of the battles on IBC’s finally came to an end, but you do not have to commiserate about that. I am sure that – sooner or later – you will read another blog from our law firm, which is introduced by the now so familiar picture of an IBC, because in the parallel proceeding (docket no. X ZR 97/11) the Federal Supreme Court remanded the case back to the Munich Appellate Court. Draft New Regulation on Border Measures: De facto Abolition of Customs Action With Regard to Patents?